I still have chronic lymphocytic leukemia; however, I am still in clinical complete remission. I am grateful. It has been six years on ibrutinib. Patients in the NIH study I am participating in, who have relapsed on ibrutinib, have had prior treatment. None of the patients who have taken Ibrutinib as a frontline treatment for CLL with 17p deletion have relapsed in the study. That is incredibly good news for me. Minimal residual disease (MRD) negative status is reached when counts are less than 0.01 percent. MRD negative status has not been found in 17p deleted participants on one drug. My last cytometry test revealed that my counts are 0.09 percent… close, but no potato. Those participants who have reached MRD status often wonder whether they could stop taking the drug. Dr. Adrian Wiestner is my doctor at the National Institutes of Health in Bethesda, Maryland. While there is a push for stopping treatment with Ibrutinib after a fixed time, he believes there is a strong scientific argument to continue the B-cell receptor indefinitely. Latest advances in technology have made it promising to detect evidence of cancer – minimal residual disease (MRD) – that continue even when traditional tests come up good. Two Phase II studies of a German CLL study group discussed the value of MRD negative status (Kovacs et al, 2014). Here is the take-away: Both MRD negativity (with a threshold of <10-4leukemic cells per leukocytes) and the occurrence of a complete response (CR) predict long progression-free survival (PFS). This means a longer time without disease growing back. Perhaps this will be a prerequisite for a cure. Take care my friends. I am hanging in there for the long haul. Back from NIH and the meeting with my medical team. I had the wonderful experience of sharing some time with my blood brother George and my blood sister Fran. I remember one time years ago we were laughing so hard in the clinic lobby. We were laughing about cancer. Yes, we have a sick sense of humor. It has gotten us through all these years together as survivors. Good news! No more CT scans or bone marrow biopsies in this clinical trial for me. I am going on six years with ibrutinib. Well another boring normal blood report. My platelets are in the normal range but at the lowest it has been. These numbers fluctuate with infections. My white blood count is 9.7 (3.98-10.04 K/uL) is normal. Lymphocytes Absolute: 1.34 (1.18-3.74 K/uL) is normal. There are two arms of this clinical trial: Arm A for elderly (65 and older) and Arm B for 17p deleted. Even though I am technically “elderly” now, I am in the Arm B – the poor prognosis arm, the difficult cases. There are 35 of us in the B arm and eight are out of the study because of relapsing. Most have moved on to venetoclax prescribed by their home doctor and are doing well. Those patients come to NIH for follow-ups and NIH acts as a consultant. The rest are either in alternative clinical trials. One relapsed on venetoclax and had an unsuccessful CAR-T procedure at Seattle Cancer Care. We had to sign another clinic consent form because five ibrutinib users throughout the United States have had issues with arrhythmia, which is irregular heartbeats. I do not have scientific evidence, but most of the patients I know about who have this side effect have had prior heart issues before going on the drug. I had an appointment with my cardiologist a couple days after I returned from NIH to see if I needed to be on blood pressure medicine due to the side effect of increasing high blood pressure. I made the appointment three months ago. I thought that was one of my side effects, since my blood pressure has been increasing the past year. Surprise! My blood pressure at NIH was 123/51. In the second NIH reading the diastolic number (bottom) went up a little. My cardiologist looked at all my readings from the past month and my blood pressure is normal. He said I must have fixed myself. Diet and exercise is the key. Here is the humor in that statement: Because I have had a bum knee, I have not exercised the past couple of months and gained several pounds. As a post-menopausal woman, I can look at a slice of bread and it appears on my hips, if I don’t exercise. Go figure! 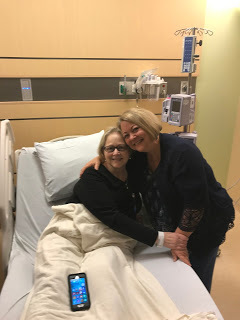 Monday, April 9, 2018 I lost a very special blood sister, Lisa Minkove. People who know me understand that I rarely cry. It has been conditioned out of me, but I am crying now. I am heartbroken. Lisa was a CLL patient advocate. Her facebook page offered words of wisdom for women battling CLL, as well as scientific papers. This was her second act. A little over a year ago I visited Seattle Cancer Care and spent some time with Lisa. She had relapsed on ibrutinib and the medical team was trying to find another option for her… and another… and another. This time we were hoping for a cure with the CAR-T procedure. Lisa was a patient at Fred Hutch and SCCA for seven years with Dr. Maloney. Lisa wanted Dr. Brian Koffman to get in the trial before it was filled, since they were accepting only seven more participants in the Phase 1 trial. Lisa talked to the trial medical team about him. I told her that my blood brother Dr. Brian Koffman was also a patient in SCCA and he was having the same procedure and that she should seek him out. She chuckled and said she had already done that, but did not meet him and his wife in person until right before she received the infusion. Dr. Brian was further along in the procedure than her, because she had to deal with a bout of shingles which delayed her procedure. I communicated with her a couple days before she passed. She was in good spirits. I told her how courageous she was. She believed she was there for the purpose of helping others learn about leukemia. Lisa was a brilliant woman. She documented her journey to help others. We discussed the science of her being refractory. We joked that we were both members of the aggressive club. Even though I was 17p deleted (high risk) and she was not, we joked that she may have me beat. She was hopeful and a positive spirit. I just had a fleeting memory come through my mind. A couple years ago she made me some beautiful handmade jewelry. She mailed it to me just because. You see Lisa was a really special spirit. She shared her heart and mind. I will never forget her. Thursday morning I am headed on a plane to National Institutes of Health in Bethesda, Maryland for my quarterly medical team checkup. I will be thousands of miles in the air and be landing just about the moment she is laid to rest. I will be thanking God that he put such a lovely human being in my path of life. For that I am forever grateful. “With the heaviest of hearts we regret to announce the passing of our mother, Lisa Minkove. She courageously looked cancer right in the eye, never once gave up hope and was a shining example of grace and positivity for those around her enduring the same- especially to her wonderful friends. She had an online support group of over 900 women with the same or similar cancers who she would offer advice and do research for. This group has been her passion and the women she met through it have become some of her closest friends. 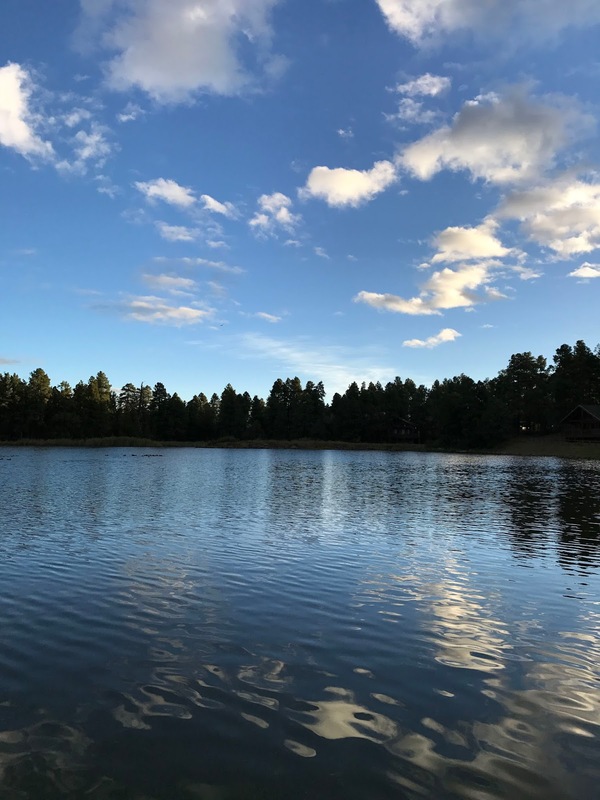 Recently I was fishing in the White Mountains of northeastern Arizona with my husband, Carl. I leaned against the bench on the lake dock breathing deeply and quietly drinking the last sips of my coffee, as Carl prepared my fishing pole. I am spoiled that way. The smell of the coffee mixed with the smell of the garlic power bait on my fingertips created quite an unusual aroma. I cast my pole like a dancer doing a glissade. Plop. The sun peered from the clouds that joined me in dancing through the sky. It was a particularly windy day and the howling of the wind mingled with the chirping of the birds and the rustling of the leaves. Every once in a while I would hear a quack as a family of ducks swam under the dock avoiding my line. A blanket of swallows dove into the lake gobbling up insects. I heard the honking of barnyard geese and glanced up. A perfectly formed “V” darted trough the air. And then an osprey hovered over the water, spreading his talons open, and snatching a trout. I believe he stole MY fish, since I didn’t even get a nibble that day, but I did not care at all. 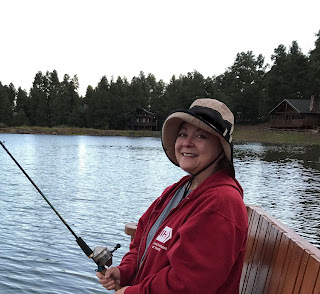 I was fishing for mindfulness. I am a cancer patient. I am in clinical complete remission, but I am not cured. Four times a year I fly from Arizona to the East Coast to pick up my drug that was experimental, but is now FDA approved. This keeps the cancer at bay. Mindful meditation has helped me to keep my sanity. It has helped me to be grateful for every day. It has helped me find peace and love in the chaos of a cancer diagnosis. Mindfulness is a special awareness and art of being still. My father, who was Japanese, encouraged the ancient technique of passing thoughts clearly through the mind through meditation. Meditation (dhyana) is a specific scientific technique of clearing and quieting the mind, focusing inward, and arriving at a place of inner consciousness different from the normal waking state. The purpose is to experience peace and gratitude. Our mind is often wild and uncontrollable. Negative self-talk often causes anxiety and self-doubt. Meditation is a way I use to calm myself emotionally and physically. Meditation rewires your brain to be more positive. It begins with the body. Sit in a comfortable posture in a quiet place. Close your eyes and straighten your back. Relax all muscles except the head, neck and back. Inhale through your nose sticking out your belly using your diaphragm. Breathe out slowly through your mouth. Focus on the sound that your breathing makes, a short prayer, a word or phrase. Repeat it as you inhale or exhale. Let go of the tension. Don’t let your mind wander. If it does, take a deep breath and say to yourself, “thinking, thinking’’ and refocus. Begin by practicing five minutes. Then 10 minutes. You will be surprised how even 10 minutes a day can help you relax and be calm. Twenty minutes of mindful meditation is ideal. Be patient. It takes time to learn. A couple years ago, Sara Lazar, a neuroscientist at Massachusetts General Hospital and Harvard Medical School, examined the benefits of mindful meditation using brain scans.1Because of her running injuries during the training for the Boston marathon; she began to do stretching exercises through yoga as a form of physical therapy. Lazar was very skeptical of the claims made by her yoga instructor about how yoga “increases your compassion and opens your heart.” Since mindful meditation is an important part of yoga, Lazar decided to compare participants who practiced mindful meditation to a control group of those who did not. The results of her scientific studies using brain scans concluded that people who meditate have enhanced senses. The gray matter in the insula, sensory regions, the auditory and sensory cortex of the brain are increased, as is the gray matter in the area of the brain (frontal cortex) which directly affects executive decision making and working memory. Johns Hopkins University in Baltimore, Maryland identified 47 well-designed scientific trials with 3,515 participants that addressed the role of mindful meditation in easing mental stress, such as anxiety, depression and pain. Their findings, published in JAMA Internal Medicine2found that mindful meditation programs had moderate evidence of improved anxiety, depression, and pain. A randomized clinical trial3 was conducted at the University of California, Los Angeles from January 1 to December 31, 2012 using 49 adult participants with the mean age of 66.3 years, who had trouble sleeping. Half of the adult participants completed a mindfulness awareness program. The other arm of the study completed a sleep education class on improving sleep habits. The researchers were aware that sleep disorders are often connected to stress. The results showed significant improvement on insomnia and depression symptoms, as well as validated measures of fatigue severity and interference in the mindfulness awareness program arm. A relaxation response through mindful meditation shifts the body into the opposite of the stress response. For 10 to 20 minutes a day mindful meditation can improve your psychological well being, reduce psychological stress and pain, and improve your sleep. And it does not cost you anything. 2Goyal, M. et al (2014). Meditation Programs for Psychological Stress and Well-being: A Systematic Review and Meta-analysis. JAMA Internal Medicine; 174(3):357-368. doi:10.1001/jamainternmed.2013.13018. Dr. La Verne Abe Harris was a tenured Associate Professor at Purdue University in Computer Graphics Technology and the director of the Idea Laboratory, a creative thinking, interactive media, and animation research and development laboratory. Prior to that she was an Assistant Professor at Arizona State University (ASU). She received her PhD from the University of Arizona and her Master’s and bachelor’s degrees from ASU. Before coming to ASU, Dr. Harris was the owner and creative director of Harris Studio, the art director of The Phoenix Gazette, the computer graphics production manager of Phoenix Newspapers, Inc., an editorial illustrator for the Arizona Republic, and the art director of an advertising agency. That was B.C. – before cancer. She left Purdue University at the height of her career when she was diagnosed with a very poor prognosis of CLL: 17p deletion, TP53 mutation. She was the recipient of the ugly side of a common cancer. Diagnosed in 2009 she was chemo-resistant, had less than a 1% chance for a bone donor match, and could not find a clinical trial in which she qualified at that time. She is alive today because of an experimental drug (PCI-32765, scientifically known as ibrutinib, and branded as IMBRUVICA) that is now FDA-approved. 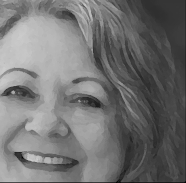 Today she is a cancer survivor, artist, patient advocate, political activist, blogger (www.DrLaVerne.blogspot.com), and occasionally a stand-up comedian for cancer patients. Hi! My name is La Verne Abe Harris. I was a creative director and art director for many years until I switched careers and became a university professor at Arizona State University and Purdue University. I had a research and development lab “The IDEA Laboratory,” which focused on creative thinking, interactive media, and animation. I used to be referred to as “the EverReady Bunny” – highly energetic and productive. One day I went to my internal medicine physician complaining of fatigue. I thought I either had mononucleosis, was working too many hours, or was feeling the onset of aging. He did a blood test and found my white blood cell count to be elevated. He ordered a cytometry test and thought my diagnosis of CLL/SLL was a mistake, because I wasn’t a white 75 year old male. I was a Eurasian (Half Japanese and half German) 57-year-old female. He had a physician friend review it again under the microscope to confirm the diagnosis. I was told that some people with CLL/SLL live 20 years plus and die with leukemia, not from it. All would be well, as long as I was not diagnosed initially with 17p deletion. According to one expert, an initial diagnosis of 17p deletion would mean I would be hospitalized within six months of diagnosis and would not live more than two to three years. I wanted to be one of the “lucky” ones. I found out a month later from a FISH test that I was not. I was diagnosed with 17p deleted, chemo-resistant leukemia. In 2009 there were no options for me. I was given a poor prognosis. I persistently researched and networked with leukemia experts around the country. I not only got a second opinion, but also a third and a fourth. Dr. Michael Keating (the father of FCR) at M.D. Anderson in Houston took me on as a patient and has kept me informed on the research that is being done on 17p deleted patients. Dr. Keating told my husband Carl and I about Ibrutinib (PCI-32765) when it was first being tested. Along my journey I have also run into a few Dr. Buzzkills. That is the term of endearment Carl and I have given to physicians who have poor bedside manners, who have coldly reminded me of my impending death, or who have been ticked off because I have ruined their research by being an outlier on the statistical charts. People, it is YOUR life! Do not sit idly by. Be actively involved in your health decisions. God only knows why I have been so resilient, but I am here today. I am a person of faith, who also loves science. I believe in the synergy between body, mind, and spirit; therefore, I believe in modern medicine and complementary treatments, such as Reiki, reflexology, meditation, prayer, and herbal supplements. I also know that the only thing I really have control of is my attitude. I feel blessed to be B22 in the Ibrutinib (PCI-32765) clinical study in Bethesda, Maryland. This blog is a testimonial of my journey with the BTK inhibitor. ®La Verne Abe Harris. Awesome Inc. theme. Powered by Blogger.